Finding a good spin bike can be difficult for people who are too short and as well as for people who are tall. Getting a good spin bike, only to notice that the spin bike is not for your height is a disappointment. Before getting a spin bike, the important step is to determine the height range that the spin bike can accommodate your height. Finding a good fit is very important to avoid any injuries due to improper workouts. For proper workout and strength training, finding a good spin bike that suits your height is very much essential. Console - RPM, heart rate, time, resistance levels, and distance. Along with the height of the seat, you need to also take a look at the distance of the handlebars from the seat. If the distance is more, you may need to lean front more to reach the handlebars causing more strain on your back. These two are the most important factors you need to consider before getting a spin bike being a short person. Apart from these two factors, you obviously need to also look at the build quality, comfort, and features that the spin bike has got to offer. In this post, I’ll present you some of the best spin bikes for short people. 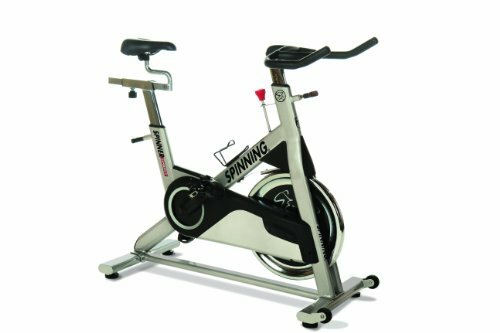 This the best spin bike for short people and also one of the widely popular spin bikes. Adjustability: The spin bike can easily accommodate people of heights between 4’ 10’’ to 6’ 7’’. The greatest part of this bike is the adjustability. Both the seat and the handlebars are 4-way adjustable. That means the seat can be adjusted vertically and horizontally and well as the handlebars. Build and features: The bike is a pleasure to look at. The bike is specially built with durability and rough use in mind. That’s why Keiser gives you 3 years of warranty that is really unheard of in the exercise biking world. This bike comes with Eddy current magnetic resistance system with 24 levels, which results in a smoother workout with no noise as there are no pads to rub against the flywheel to cause the resistance. The bike also comes with a water bottle holder. Coming to the console, it comes with an ambient light sensor that automatically turns on the backlight when needed. The console displays essential information like RPM, heart rate (pulse rate sensors are located on the handlebars), time, resistance levels, and distance. Comfort: As I told you earlier the 4-way adjustable seat and handlebars makes you easier to find the ideal position while riding the bike irrespective of what height you are. The Keiser M3i comes with dual Shimano pedals. On one side you can use cycling shoes and on the other side, there is a toe basket and straps for getting you a good grip on the pedals. The bike is very silent as it comes with a magnetic resistance system. It helps you ride peacefully while others are sleeping or watching TV without disturbing them with the rubbing sounds. Adjustability: This spin bike accommodates people from 4’ 10’’ to 6’ 7’’. That means, even if you are short you can get easily accommodated on the bike. 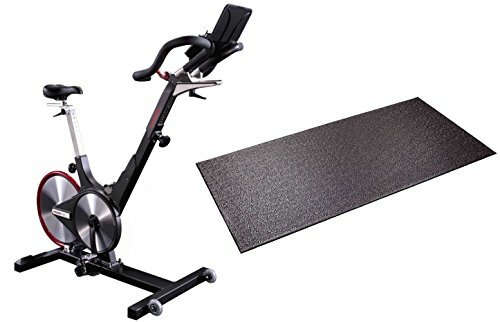 The seat of this spin bike is adjustable in 4-ways. You can adjust the nearness of the seat to the handlebars and as well the height of the seat. On the other hand, you can also adjust the vertical height of the handlebar so that the short people can easily reach the handlebars. The adjustability of the bike relies on the pre-set holes which can be set as per your wish. The resistance provided by this bike is mechanical. You need to tighten the knob for increased resistance. You do not have the option to change the levels of resistance to some preset levels. As the resistance provided is friction based, a quite noise is existent while driving this bike. Along with this, you also need to replace the rubber pads periodically. Build and features: The stabilizer bars and the 4 levelers that this bike comes with ensures that your bike is sturdy on the ground no matter how intensely you are working out. The resistance mechanism is mechanical. You need to turn the knob, and it pushes the leather pads closer to the flywheel causing an increase in resistance to your pedaling. Comfort: The seat is cushioned and soft. But as like that of any other spin bikes, the seat maybe little uncomfortable for some people at first before they get used to it. As the bike comes with mechanical resistance as opposed to the magnetic resistance that high-end spin bikes come with, it makes a lot of noise. This is due to the leather pads rubbing against the flywheel causing resistance to your workout. The pedals are dual-sided so that you can use both athletic or cycling specific shoes with this. Adjustability: This spin bike is suitable for people between the 4’ 10’’ to 6’ 10’’. The seat is 4-way adjustable. The handlebars unlike that of Keiser M3i, is only adjustable vertically. The bike makes use of the mechanical resistance. You need to turn the tension knob which allows you to adjust the resistance incrementally. The knob tightens the leather pads and rubs the flywheel causing resistance. The resistance pads that rub against the flywheel need to be lubricated periodically. And also, due to the wear and tear the resistance pads gets weak so that you need to replace them every year or a two depending on your usage. The drive is pretty silent but the noise is there considering the resistance to be friction-based. But the noise is not too loud. Build and features: The bikes comes with a steel frame and a 43lb flywheel that ensures that the bike won’t wobble while riding. The bike is built very solidly. The bike comes with a 1-year warranty. The pedals come with the toe baskets and straps to slip your shoes in so that you get a great grip while riding intensely. The bike comes with a water bottle holder to ensure that you stay hydrated. But, the bike does not have a console which is a major downside. Comfort: The seat is pretty hard. Most of them find the issue to be solved when using a gel cover that offers good padding. The bike makes some noise as it comes with a mechanical resistance. But it is not as noisy as other mechanical resistance bikes. There are not many good spin bikes that are suitable for short people. I did a thorough research online and I found the above spin bikes to be very suitable for short people. If you are not budget constrained, then Keiser M3i is the best bet. Or else the Spinner S7 is a great affordable spin bike for short people.